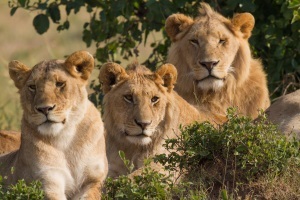 Because they are vicious hunters, lions have earned a spot among the top of the food chain. One feature that makes this species so vicious is their teeth. In fact, lions have three different types of teeth that help them bring down and finish off their prey. Lions use their long, sharp canine teeth to pierce a victim’s neck or spinal cord. Then, they use their casnassials, or cutting teeth, to slice through their prey’s flesh, while they use their molars to crack their prey’s bones. This ferocious predator, which typically weighs nearly 600 pounds, has a number of other traits that make it one of the world’s most dangerous hunters. For example, they have long claws, which they can retract into their paws. The color of dry grass, lions also use their sneaky camouflage skills to trap unsuspecting mammals like zebras, antelopes, giraffes, and sometimes even humans. Typically, these hunting strategies are most often used by female lions, who hunt while males defend their territory and cubs. Though lions often hunt solo, they have a much better chance of seizing prey when they work as a team. While most lions live in the open savannahs and deserts of Africa, some small groups inhabit northwest India’s Gir Forest National Park and other, smaller families live in various places around the world. Relatives of the lion species, which belong to the genus panthera, include the jaguar, the snow leopard, and the tiger. There are many different types of cats, big and small, but it is no doubt that deadly lions are truly the kings of the jungle.